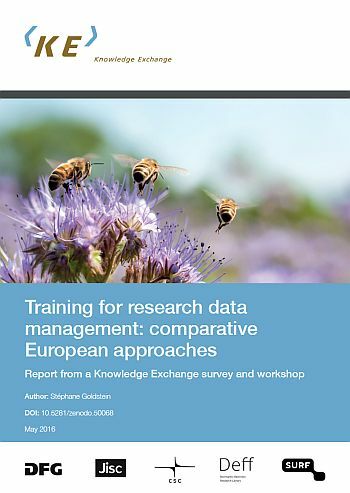 Knowledge Exchange (KE) has released a new report: “Training for research data management: comparative European approaches” is it called and it marks the preliminarly result of a longer time of discussions among several European stakeholders and communities. The group developed a survey to collect information on current practice around RDM training, in order to provide an overview of the RDM training landscape in several European countries. Subsequently, a workshop in February followed to share successful approaches to RDM training and capacity building provided within institutions and by infrastructure. Awareness building is seen as by far the biggest perceived impact of the training. How to develop among researchers, and others, an awareness of RDM training needs ? Means of measuring the success and impact of training interventions, along with changes in practice and behaviour. The challenges associated with the successful implementation of training initiatives. The role of different categories of players, other than researchers themselves, notably research administrators, records managers and archivists, learned and professional bodies, and research funders. Elaborating on these questions, the discussions considered what might be done, practically, to make training more relevant to the professional lives of researchers, and to encourage good RDM practice with a view to effecting behavioural and cultural change. Providing incentives for training, professional development and good practice from research funders, learned / professional bodies and publishers. Charting the RDM capabilities of universities. Identifying the RDM roles of key professional groups. Engaging with learned / professional bodies to assess whether and how their policies and practices relate to RDM. Investigating the potential for a sustainable registry of information on training resources. In my personal opinion, the workshop and the survey were a good starting point to learn form each other and to hear about practises in other European countries. Of course, the whole work in this particular field is not finished by publishing a report. It is much more a starting point for further discussions and cooperation. The challenges in RDM and in training researchers are an important task for the present and also for the future. It is clear, that many efforts are needed to archieve the goal to train substantial parts of current and future researchers.